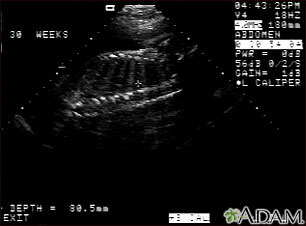 This is a normal fetal ultrasound performed at 30 weeks gestation. In the middle of the screen, a clear outline of the spine and ribs is visible. The cross hair is between two ribs just above the spine. Updated by: John D. Jacobson, MD, Professor of Obstetrics and Gynecology, Loma Linda University School of Medicine, Loma Linda Center for Fertility, Loma Linda, CA. Also reviewed by David Zieve, MD, MHA, Medical Director, Brenda Conaway, Editorial Director, and the A.D.A.M. Editorial team.